An Thamnophis sirtalis in uska species han Colubridae nga ginhulagway ni Linnaeus hadton 1758. 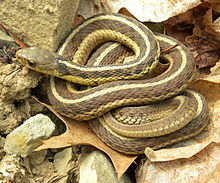 An Thamnophis sirtalis in nahilalakip ha genus nga Thamnophis, ngan familia nga Colubridae. Ginklasipika han IUCN an species komo diri gud kababarak-an. ↑ 1.0 1.1 "Thamnophis sirtalis". IUCN Red List of Threatened Species. Version 2012.2. International Union for Conservation of Nature. 2007. Ginkuhà 24/10/2012. ↑ Duméril, A.M.C., G. BIBRON & A.H.A. DUMÉRIL (1854) Erpétologie générale ou Histoire Naturelle complète des Reptiles. Vol. 7 (partie 1)., Paris, xvi + 780 S.
↑ 6.0 6.1 6.2 6.3 6.4 Baird, S. F. and C. Girard. (1853) Catalogue of North American Reptiles in the Museum of the Smithsonian Institution. Part 1.-Serpents., Smithsonian Inst., Washington, xvi + 172 pp. Ini nga pakli kataposan nga ginliwat dida han 11:46, 22 Hulyo 2013.